G’day everyone. 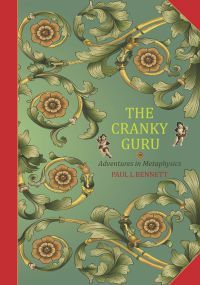 I’m PAUL and I’m a METAPHYSICIAN and a PASSIONATE MEDITATOR and I’m known as THE CRANKY GURU. GURU because I LOVE LEARNING ABOUT OUR UNIVERSE and SHARING what I learn and CRANKY because I will NEVER KNOW ENOUGH! And even if I did KNOW EVERYTHING there was to know about METAPHYSICS and MEDITATION or any other topic of interest, I would have simply reached the LIMITS OF MY UNDERSTANDING. So I think it’s always good to stay humble and keep the MIND OPEN to NEW THOUGHTS and IDEAS. And the truth is, we’re ALL GURUS anyway, massively GRANDER and more AWESOME than we can possibly UNDERSTAND or even ACCEPT. As some of you may know, I WROTE A LITTLE BOOK on Metaphysics called, ‘The Cranky Guru – Adventures in Metaphysics’. And I’ve brought some along to share with you today, in case you’d like to know more about my personal take on Life, while I’m still SLOGGING AWAY on my second book ‘Love youse all – Random Thoughts on life from a Self-confessed Eccentric’. And I AM TOO! Ask anyone! I’ve called my talk today “HOW TO FIND TWO PRECIOUS MINUTES OF NOTHING.” And you might be thinking, THAT’S NOT MUCH. He’s COME ALL THIS WAY to deliver just 2 minutes of NOTHING? Well, the truth is NOTHING is really SOMETHING few of us EVER FIND TIME FOR and I sincerely hope by the end of my short talk, you will VALUE NOTHING a lot more… than just NOTHING! My talk is actually about TURNING OFF the INTERNET and TURNING ON the INNERNET, so HOLD THAT THOUGHT! So HOW ARE YOU? It’s always nice to ask isn’t it, but the truth is, I’m NOT actually EXPECTING an answer. It’s a FIGURE OF SPEECH which has gone into the vernacular for ‘HELLO’ and of course, there are MANY OTHER EXAMPLES in english where words do not convey their actual meaning. For instance we ASK CHILDREN, “What do you want to BE when you grow up? but what we really mean is WHAT KIND OF WORK WOULD YOU LIKE TO PURSUE? And it’s not mere SEMANTICS either! DOING and BEING are profoundly DIFFERENT things! Of course, ASK our beautiful granddaughter MARNIE this and she will say, “I want to BE a VET and look after all the little ANIMALS.” and that’s really SWEET, but this is a DOING activity and even at three years old I think it’s CRITICAL to get this right. BECAUSE we need to understand that BEING is profoundly DEEPER than DOING, regardless how much we love our vocations. In fact, it’s SO DEEP, it’s largely UNNOTICED from our perspective. Certainly, we are ALL HUMAN BEINGS in the physiological sense, but on the DEEPEST possible LEVEL, we are ‘HUMANS BEING’ and in this experiential existence as it stands, all we can BE is HUMAN, which is a truly WONDERFUL THING, but not a VET. So let’s FOCUS on this MISNOMER now and consider just how LITTLE CONTROL we actually have over our ‘BEINGNESS’. Most MEDITATION PRACTICES FOCUS on the BREATH, but WHO is doing the breathing? Well, WE’RE breathing, but I could joke that if I was PERSONALLY RESPONSIBLE for my BREATHING or keeping my HEART beating or my LIVER functioning, I’d be DEAD a long time ago! WHOOPS! FORGOT! DEAD! So the POWERS THAT BE, however you want to consider them, DON’T LET US anywhere near the ACTUAL BRAINSTEM FUNCTIONING of our LIVES. Our breathing, cardiac function, liver function etc. We’re NOT ALLOWED anywhere near that! So we take an ENORMOUS AMOUNT FOR GRANTED don’t we? And I think we OFTEN FORGET that all this ‘KEEPING US ALIVE’ STUFF is actually happening at all. A QUICK POL.. We just did some DEEP BREATHING. Who’s actually THOUGHT about their BREATHING lately? MY CASE RESTS! HAHA! So, knowing that we’re NOT IN CONTROL of our LIFE SUSTAINING SYSTEMS, It’s true to say that we are ‘MULTI-DIMENSIONAL BEINGS’. That’s clear, BUT in our day-to-day WAKING LIVES, we are primarily FOCUSSED ON (dare I call it?) the MUNDANE MIND AND BODY NEEDS of our existence. And that’s the outside ‘CONSCIOUS MIND part of us. You know, the WORKING, PROBLEM SOLVING, ATTENDING MEETINGS, DOING LUNCH, HAVING A DRINK, CATCHING THE BUS practical ASPECTS of ourselves. HAHA! Because that’s who WE REALLY ARE. PROFOUNDLY DEEP. INCONCEIVABLY COMPLEX. THRILLINGLY INFINITE and IRREVOCABLY CONNECTED to one another. But I DON’T THINK we consider ourselves in those SUPERLATIVE TERMS often do we? On the contrary, I think it’s more common for many of us to feel INCOMPLETE, as if there’s SOMETHING MISSING and if we could only FIND THAT MISSING ‘THING’, we would finally be SATISFIED and HAPPY. But we WORRY A LOT don’t we? We WORRY ABOUT our JOBS and our personal RELATIONSHIPS and WHAT HAPPENED and WHAT MIGHT HAPPEN and our conscious MINDS RUN RIOT with ANXIOUS THOUGHTS! In BUDDHISM, it’s called ‘SAMSARA’, ‘SUFFERING’. And boy do we KNOW HOW to SUFFER! In fact we are PERFECTLY TRAINED for Samsara. Trained to get JEALOUS, trained to GRASP, trained to be ANXIOUS and SAD and DESPERATE and to REACT ANGRILY to whatever provokes us and these NEGATIVE EMOTIONS rise spontaneously, without us even TRYING TO GENERATE them so everything is a question of OUTSIDE INFLUENCES INTERNALISED and the POWER OF HABIT. And I’LL BET we all SAY to OURSELVES from time to time, when we’re STRESSED OUT by our BUSY LIVES, “HOW CAN I FIND SOME PEACE AND QUIET?” I want to STOP THINKING these NEGATIVE and STRESSFUL THOUGHTS.” In fact, I’d like to STOP THINKING ALTOGETHER. The FIRST LAW of Metaphysics states, “WHAT WE THINK, WE CREATE. OUR BELIEFS CREATE OUR REALITY,” So WHAT and HOW we think is CRITICAL to our WELLBEING. We need to be CAREFUL WITH OUR THOUGHTS and keep them as PEACEFUL and POSITIVE as possible. WITH PRACTICE, WE CAN do this! We just need to STEP INSIDE the TARDIS, which is our MULTI DIMENSIONAL AWARENESS we’ve lost sight of in the drama of our day-to-day living, and experience its DEEP, BEAUTIFUL INNER SILENCE, the NOTHINGNESS that’s NEVER NOT HERE, the same way that the BREATH is never NOT FUNCTIONING, or the HEART is never not beating. And we can ACCESS THIS PRECIOUS NOTHING, any time we like and it will AWAKEN in us the SKY-LIKE NATURE OF MIND and CONNECT us to our UNCHANGING PURE AWARENESS. There are many beautiful DEFINITIONS of MINDFULNESS, this PRECIOUS NOTHING. But the most beautiful I’ve heard, is that it’s A LOVE AFFAIR WITH LIFE UNFOLDING and of course, we need to be TOTALLY PRESENT to witness it. So, for the NEXT TWO MINUTES, I’d like you to ENTER THE TARDIS with me and I’ll share with you a BREATHING MEDITATION I’ve been practicing for DECADES. It really only takes TWO MINUTES of your day, but it’s benefits PHYSIOLOGICALLY and EMOTIONALLY are profound. Basically, what we’re doing with this exercise is MOVING ENERGY AROUND. You know how when you’re feeling ANXIOUS or UPSET, the anxiety or bad feelings COLLECT in your STOMACH? Well, we’re going to MOVE THAT NEGATIVE ENERGY from the STOMACH AREA up to the HEART AREA and it will completely DISSIPATE all UNPLEASANT FEELINGS. So take a DEEP BREATH IN and as you BREATHE OUT feel the energy moving from the stomach to the heart. As you CONTINUE TO BREATHE, you will FEEL HEAT, a pleasant WARMTH in your CHEST. This warmth is the PHYSICAL EVIDENCE OF LOVING YOURSELF and because it is HEART ENERGY, it just naturally RADIATES, like LIGHT coming out of a LIGHT BULB. Do this exercise for JUST TWO MINUTES, or of course you can do it for longer if you prefer. I actually do this almost constantly throughout the day. And PEOPLE WILL WONDER why they feel BETTER AROUND YOU and you can TEACH THEM how to do this exercise in the way you have just learned it, or in the way that works best for you. And the MOST IMPORTANT THING to remember is that this METHOD of LOVING YOURSELF and GENERATING HARMONY FOR YOURSELF creates HARMONY FOR OTHERS TOO. I do hope this exercise will provide a GREATER SENSE OF EASE AND COMFORT in your life no matter WHERE you are, WHAT you are doing or HOW you are living your life.